Blackberry-purple, pincushion blooms will fill your garden with colour and are ideal for cutting too! You'll receive an established plant in a 9cm pot - Not widely sold or seen in garden centres yet so get yours now! 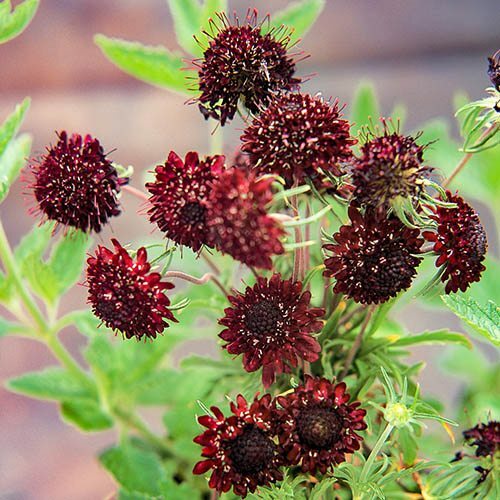 This delicious new Scabious has been named 'Blackberry Scoop' as each large, dark berry-purple flower head looks like a mouth-watering scoop of fruity berry ice cream. Perfect for any 'cottage garden' border or patio container, these beautiful new Scabious not only look good, but are also a magnet for bees and especially butterflies as they waft gently in the breeze. You'll get wave after wave of exquisite pincushion blooms from June to September every year and not only are they ideal for filling borders with or for planting in mixed pots on the patio. Bred from the cottage garden favourite, 'Scoop' is a favourite of the cut flower industry, as they flower profusely, and their tall strong stems reach almost 60cm (2ft) making them perfect for cutting - pick posy after posy for your home as your plants come back bigger and better every year! Supplied as an established plant in a 9cm pots that are ready to plant directly into final location on receipt. Blackberry Scoop is a half-hardy perennial, withstanding temperatures down to just above 0C, so will need winter protection - for best results, we recommend growing them in pots. Supplied as an established plant in a 9cm pot, ready for planting out or potting into a larger container. Deadhead regularly to prolong flowering and cut back the faded flower stems and foliage in early autumn to promote new growth. Really easy to care for, simply plant towards the front of the border, in well-drained soil in full sun. Blackberry Scoop is a half-hardy perennial, withstanding temperatures down to just above 0C, so will need winter protection - so for best results, we do recommend growing them in pots. Deadhead regularly to keep the plant flowering. Can be dug up and divided when the clump gets congested – around 3 years or so. Protect young plants from slug damage.